Human Rights in China mourns in great sorrow the tragic passing of Liu Xiaobo (刘晓波) today, at age 61. Liu was a proponent of a nonviolent citizens’ movement and a leading advocate for constitutional democracy in China. He was a Nobel Peace laureate who envisioned a better future for the people of China and, in the end, sacrificed his life in appealing for a peaceful political transformation to reach that future. In exhorting not only the Chinese government but also the Chinese people to do their part to create this better future, Liu was China’s conscience. The Chinese authorities must make a full accounting of the medical care that was provided or not provided to Liu in prison, and explain how his liver cancer was not diagnosed until the very late stage. After the loss of Liu Xiaobo, the international community now has an urgent task: governments must take immediate concerted actions to demand that Chinese authorities free Liu’s wife, Liu Xia (刘霞), from the prison of China. Liu Xia has been under house arrest, without any legal basis whatsoever, since October 2010, right after the Nobel Committee announced the Peace Prize for Liu Xiaobo. She has long suffered deep depression. The Chinese authorities must restore Liu Xia’s freedom, so that she can travel abroad, and accept the Nobel Peace Prize on her late husband’s behalf. 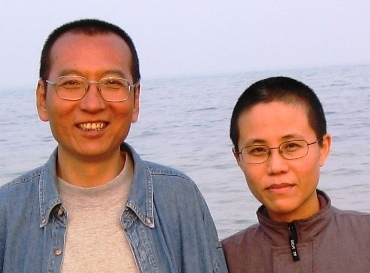 Join an AddOil Arts Action to support Liu Xiaobo!